Who hasn’t had the experience of pesky yellow jackets crashing a party or spoiling a picnic? Although harsh winter weather is sure to put an end to the nuisance posed by these buzzing bullies, the fall is actually a period where yellow jackets are known to be more aggressive than usual. This can pose a significant health risk to those that are allergic to their stings. So how can we protect ourselves against the dangers and inconveniences caused by these ticked-off wasps? First, it helps to understand a little background about the behavior of these insects. Unlike bees, which lose their stingers and frequently die in the process of stinging, wasps such as the yellow jacket can sting multiple times without any adverse effect. They don’t hesitate to take advantage of that biological advantage. The German yellow jacket species found throughout New York is an especially social type of wasps that live in large colonies and have distinct behavior patterns making them more difficult to target for pest control. They stay out of sight through much of the spring, but have a much higher profile during the summer months as they forage for food and materials to build their nests. They favor wood, paper, and even drywall as building materials and are likely to construct their nests in the walls and ceilings of houses as well as outdoors. Throughout the summer the nest grows larger and larger, until the population of a single nest commonly reaches several thousand wasps, sometimes reaching more than ten thousand. As winter approaches the entire population of the nest eventually dies out from the cold except for the queen. She survives the winter by slowing her metabolism to a crawl in an insect version of hibernation knows as diapause, then in the following season she selects a new nesting site and repopulates the colony. Since yellow jackets chew through building materials to make their nests, their presence in the void areas of walls or ceilings will actually corrode that area of the structure, making it unstable. The presence of a nest in the home is often marked by a wet stain or moisture spot, which can actually become so soft that it can easily be pushed through. This is not advisable, however, especially late in the season when the nest is at its peak and thousands of angry wasps will come pouring out to defend their home. If a nest is detected in the home, it is advisable to call an exterminator to have it professionally removed. If yellow jackets are encountered outside of the home at a gathering such as a picnic, the unwelcome guests are more than likely attracted by the food. They are especially fond of food sources that are very sweet or high in protein. If they fly close to you it is advisable to simply remain calm and move away from them. Since yellow jackets are social insects, when one of them is swatter they will release a pheromone into the air that will agitate any nearby yellow jackets, which are likely already on edge to begin with. Yellow jackets rely heavily on their sense of sight as well as smell. They have a heightened sense of where objects are in relation to each-other and navigate based on visual cues. If yellow jackets continually target a sugary drink or jar of jam, for example, a quick fix is to simply move the food source to another table. Even if the distance is only a few feet, it will often take some time for the wasps to relocate the object once it has been moved. Another idea would be to simply move whatever substance that is attracting them to the outside of your area and with any luck the wasps will continue to feed off of that food source and leave the rest of the gathering alone. 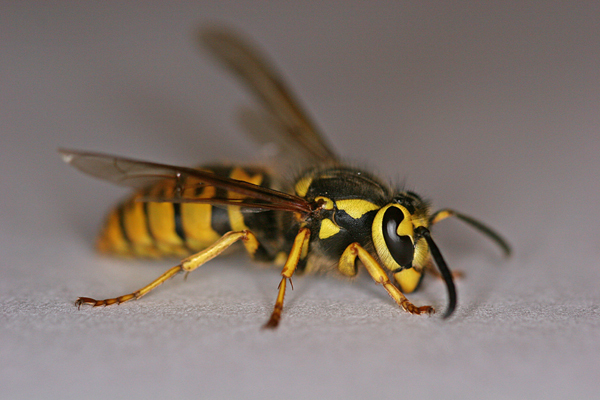 Be forewarned that wasps can also be especially attracted to those who are wearing scented perfume or bright colors. When the yellow jackets first come into the area they will likely spread out and fly all over in a haphazard pattern, but once they have zeroed in on their target they will fly in a direct line between the food source and their nests. By observing their patterns it is possible to observe if they are coming from a nest located in or around a house. An easy solution may be to simply move out of their path between the food and their nest to avoid the worst of the disturbance. Traps designed to catch wasps will not work on yellow jackets in situations like these because of the sheer number of them in each colony. This information was put together to offer helpful tips on how to manage these particularly troublesome pest, but it also paints a picture of the behavior of a highly organized species of insect. Their life cycles and colonies are both fascinating and complex. Aside from being pests, yellow jackets play an important role in controlling the population of other species of insects in nature that can be equally troublesome when not in check. For these reasons it is important not to spray chemicals at them indiscriminately, or target their nests for destruction when far away from human or animal habitation. The most effective method of eliminating a yellow jacket infestation without endangering yourself or the environment is to simply call an exterminator. This entry was posted in Uncategorized and tagged Arrow Exterminating, Fall Pests, Insect, Pest control, Wasp, wasps, yellow jackets, yellowjackets on October 2, 2013 by ArrowBugBlog.